The final leg in the 2017-edition of Route to Christmas is a more than 3000 meter long leg from the ultralong distance race Blodslitet in Norway last October. 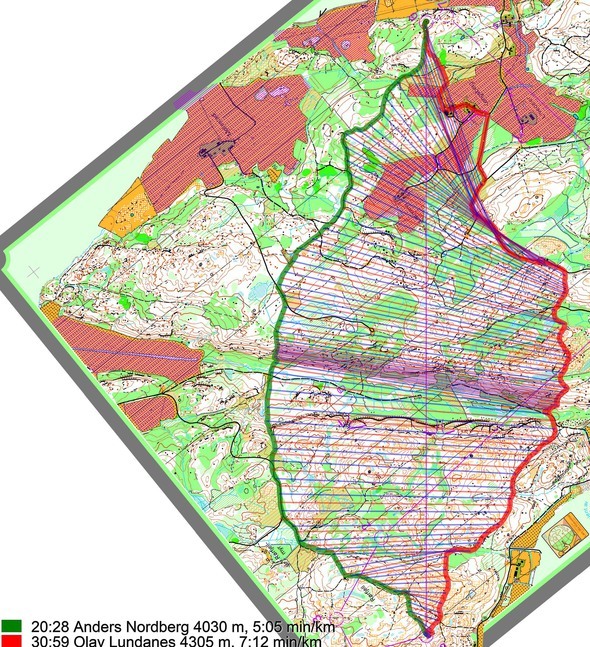 The leg has been suggested by Oleksandr Kratov, who says “I didn’t run this leg, but still I think it is one of the best long legs this year”. 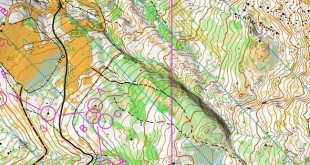 You find other maps from the area in omaps.worldofo.com here. See also latest additions in 3DRerun from this area in order to learn more about this terrain type. 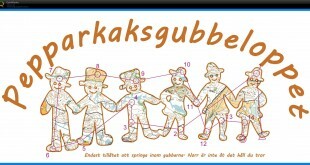 Next you can draw your own route using the ‘Webroute’ below. Think through how you would attack this leg, and draw the route you would have made. Some comments about why you would choose a certain route are always nice for the other readers. Then you can take a look at how the runners have solved this leg below. As you can see, Nordberg & Co running left are more than 2 minutes faster than the winner of the race, Emil Svensk who runs to the right. 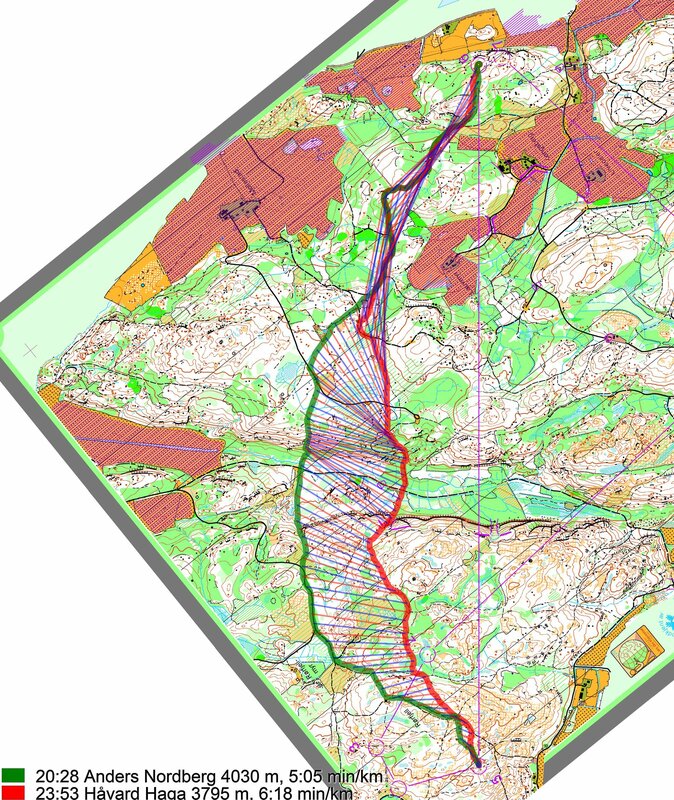 Svensk was running with Olav Lundanes on the route to the right, but as you can see on the illustration further below, Lundanes got the hammer on this leg and lost a lot of time towards the end of the leg – he is not included in the comparison here to avoid skewing the color scale. Looking at how the runners divided themselves on the different routes, you can see that 4 of the 5 fastest GPS-tracked runners chose the leftmost variant. 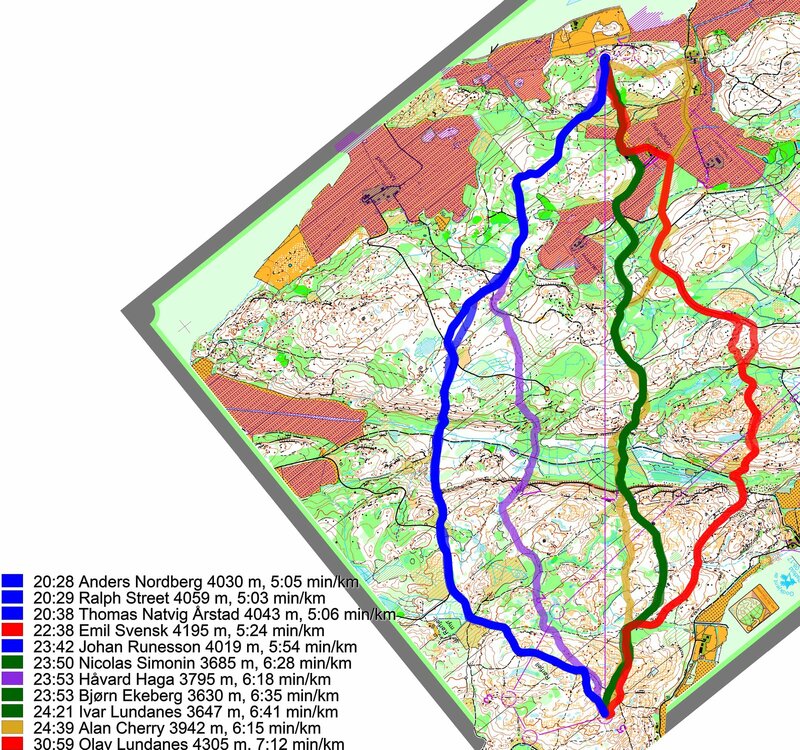 Comparing Nordberg and Svensk, you see how Svensk loses most of the time up and down the steep hillsides – the route to the right is actually also longer, although it is not that easy to see without measuring the lengths. See below for a density map of some of the ones who have drawn their routes so far. 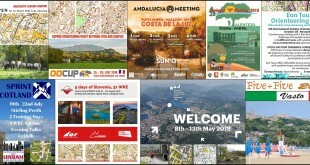 You find the complete map in omaps.worldofo.com at this location. The Route to Christmas series at World of O is a pre-Christmas tradition at World of O – giving the readers the opportunity to do one Route Choice Challenge each day from December 1st until December 24th. 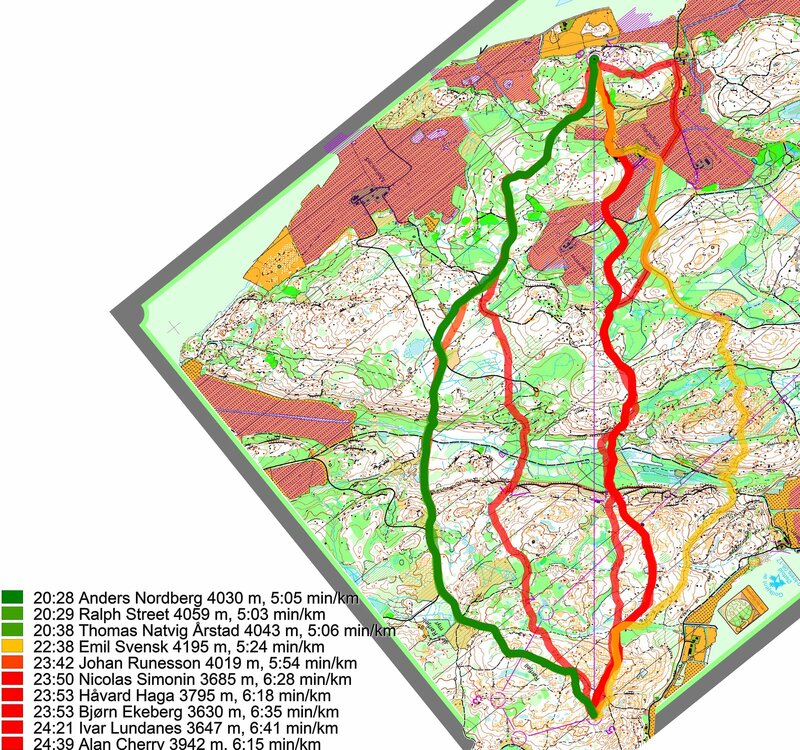 If you have got any good legs in RouteGadget, GPSSeuranta or 3DRerun from 2017-competitions – or old forgotten ones which are still interesting – please email me the link at Jan@Kocbach.net, and I’ll include it in Route to Christmas if it looks good. Route to Christmas will not be interesting if YOU don’t contribute. 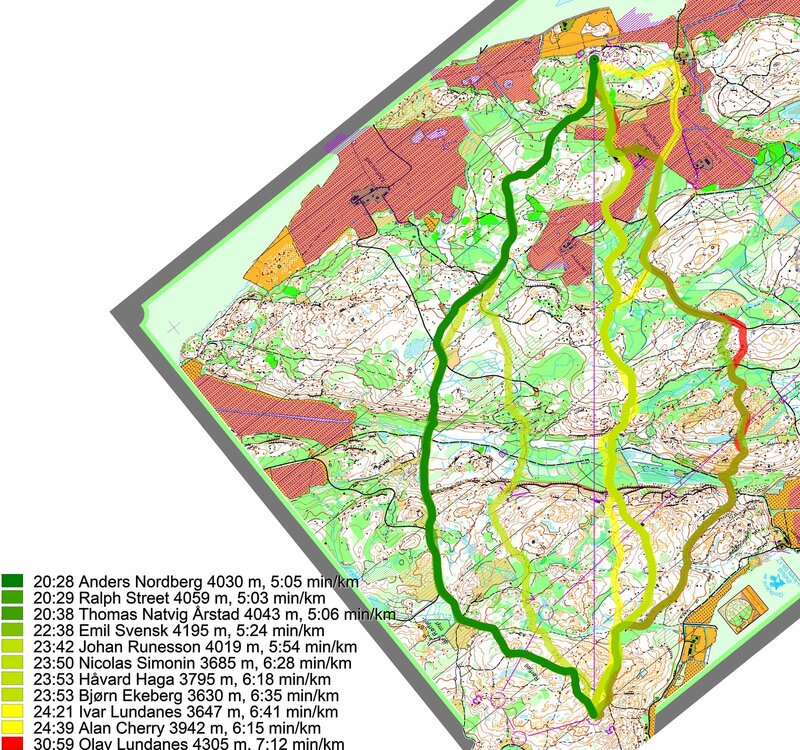 Not all legs are taken for the interesting routechoice alternatives – some are also taken because the map is interesting – or because it is not straightforward to see what to do on a certain leg. Any comments are welcome – especially if you ran the event chosen for todays leg!